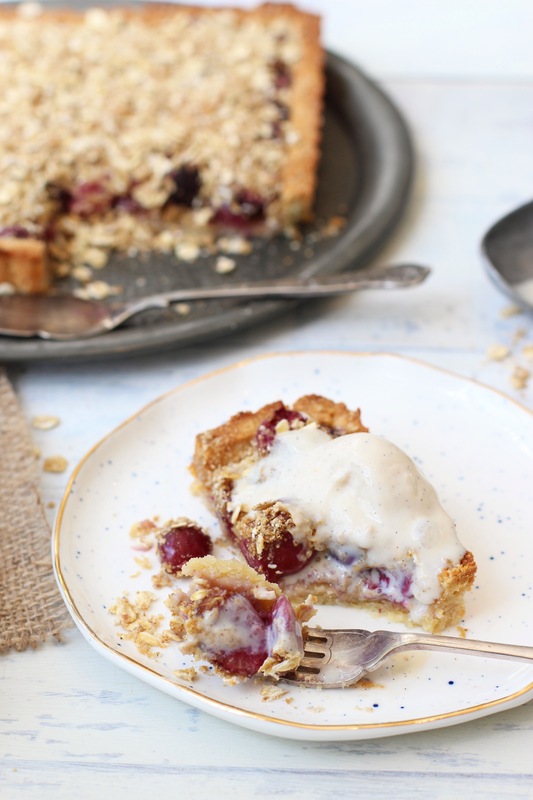 This is such a delicious summer dessert and the perfect way to take advantage of cherry season. 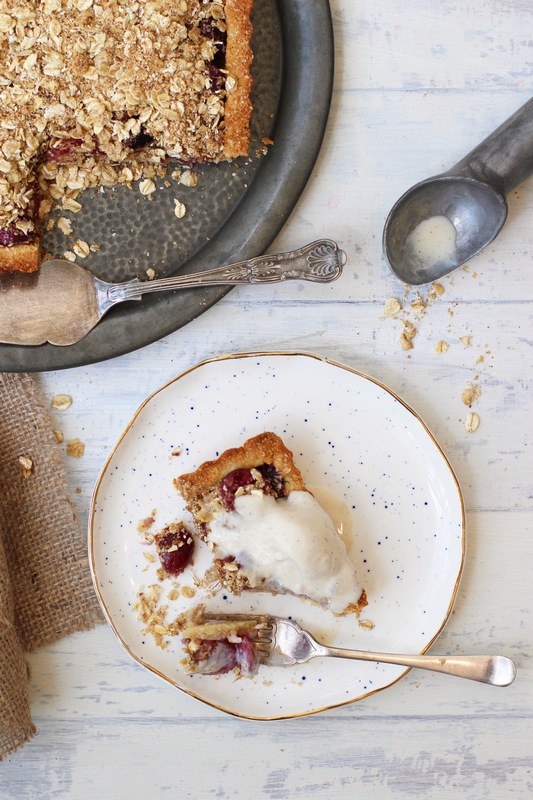 It’s the best of both worlds with the crust from a pie and an irresistible crumble topping. It’s best served warm with served with some vanilla coconut cream or your favourite ice cream, I love nobó. Preheat the oven to 180’C. Mix all of the crust ingredients together. Grease your pie dish with a little coconut oil. Use your hands to press the mixture firmly into the dish and up the sides. Bake for 8-10 minutes until lightly golden, then set aside. Add 1/2 cup (50g) of the oats to a high powered blender or food processor and blend until you have a fine flour. Divide it evenly between two large bowls. Pit the cherries and add them to one bowl with 2 tablespoons of maple syrup. Mix well. Add the remaining oats to the other bowl along with the coconut sugar and mix well. Drizzle in the coconut oil and mix well. 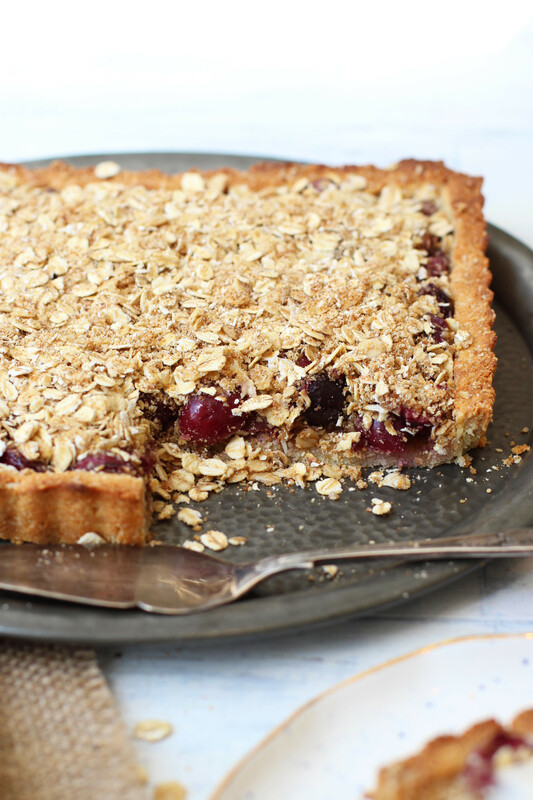 Spoon the cherries over the crust and then sprinkle the crumble generously over. Pop it in the oven for about 30 minutes until the crumble is crisp and golden. I serve mine with oat cream or dairy free ice cream. This looks lush! Can you tell me how you make oat cream? This is the first I’ve heard of it. Thanks for such a wealth of great recipes, I love your work!